When you invest money, it’s always a good idea to put some money into a safe asset that is low risk. This acts like your safety net and ensures that you’re never likely to lose all of your funds at once. It’s the recommendation of most investment firms and financial advisors and it’s generally good practice for anyone who wants to invest their money the smartest way possible. So what makes gold such a safe investment? The simple answer is its rarity. Gold will always have intrinsic value because it’s so incredibly rare. That means that even when the economy is in severe flux, owning gold will always mean owning something that is in short supply and that will have value. This has held true throughout history, when gold has been able to retain its value and even become more valuable during economic hardship. Better yet, gold is inflation-proof. If the government sees fit to print lots more currency, then you can rest assured that the value of gold won’t change. In fact, gold is what gives money its value. There are plenty of ways to invest in gold, from investing in ETFs of gold mining equities, to investing in gold bullion stored in a vault somewhere. The best and most straightforward way to invest in gold though, is to buy gold coin. This lets you buy any amount to suit your budget, it means you can actually physically own the gold and therefore not have to pay when you want to ‘withdraw’ it, or for the privilege of storing it. And finally, investing in gold coins means you get to buy beautiful coins with stunning designs that are a part of a given nature’s history and culture. Where should you start? 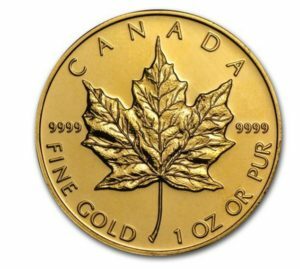 Canadian maple leaf 1-ounce gold coins would be a great choice! 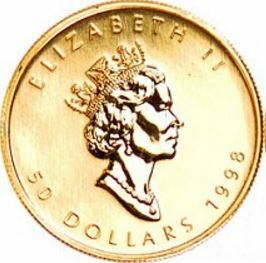 As the name suggests, the main feature of the Canadian maple leaf 1-ounce gold coin is the maple leaf. The leaf is placed right in the center and is reproduced in stunning detail, with each vein marked out so you can see it. Writing on this side reads ‘Canada’ along the top, ‘Fine Gold’ along the left bottom and ‘1 Oz or Pur’ on the right bottom. On the front meanwhile, is an image of Queen Elizabeth II alongside the legal tender value of $50 Canadian dollars. The image of Queen Elizabeth II sees her in portrait, looking just to the right and has a low level of detail that is stylistic and flattering. The date is printed alongside the image. All in all, it is a striking coin and one that is a pleasure to own. This coin has been among the most popular bullion gold coins for many decades. It was first issued in 1979 and today is able to compete with other pure gold coins, including the incredibly popular American gold buffalo. While the coin comes in many sizes, it is most popular in 1/10oz, 1/4oz and 1oz. The Canadian maple leaf 1-ounce gold coin trades for a premium that is above its weight in gold thanks to its artistry and collectible nature. Of course the value as ever is symbolic but does come with the guarantee of a sovereign nature. This is one of the things that has helped to make this such a popular coin. However, it does also feature other advantages. For instance, because the coin is guaranteed as to weight and purity by the Royal Canadian Mint, that ensures that it will be accepted worldwide as standard. Dealers also publish daily buy and sell prices, which makes them that much easier to trade and further makes them a great choice as an investment. Because there are a significant number of these coins in circulation, the premium over spot is very low and that makes it an attractive choice for those wanting to make a big investment. It’s very popular for retirement accounts. What’s more, is that the Canadian maple leaf 1-ounce gold coin is a pure gold coin, which makes it very popular with the larger European and Asian audiences. The Royal Canadian Mint also issues hard plastic tubes capable of holding 10 coins. This will snap tightly shut to secure the coin and that makes it particularly convenient for storage and for transportation. These factors, along with the beautiful appearance of the coin, make it a particularly easy coin to come by and to sell and in general it is a big advantage to trade with such an already-popular type of coin. If you’re looking for a solid investment that will protect your cash and see it grow steadily long into the future, then gold coin is a brilliant place to start. And in that case, why not choose the Canadian maple leaf 1-ounce gold coin for something guaranteed and that will be great to look at?